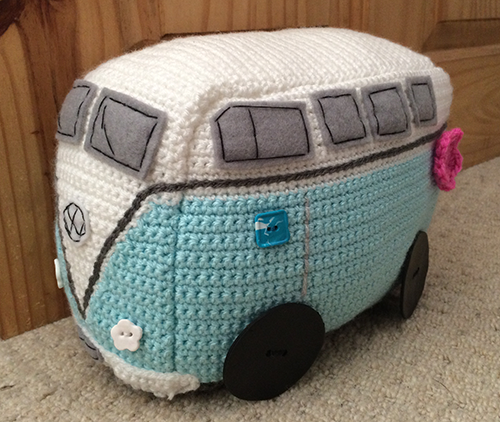 Whilst browsing the local newsagents I came across an edition of Inside Crochet magazine that featured a lovely pattern for a crocheted VW campervan doorstop. 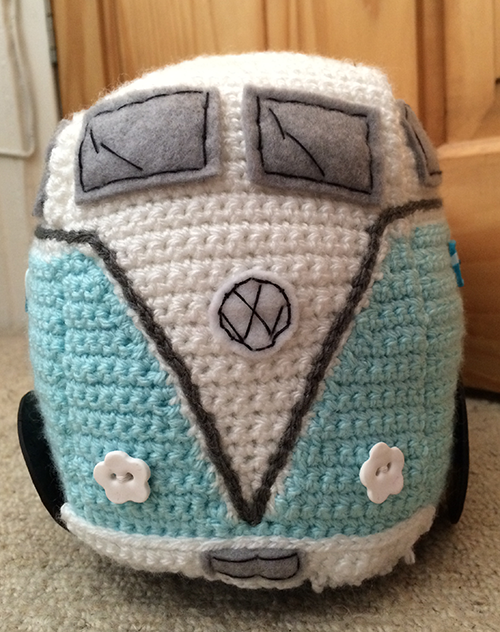 I love campervan’s and the pale blue, split-screen model is my absolute favourite, so I new I had to make this. As usual I wanted to make some tweaks to the pattern. I thought the design didn’t quite match the classic look of a VW campervan, so I redesigned the ‘V’ on the front of the vehicle and increased the depth of the colour on the sides. 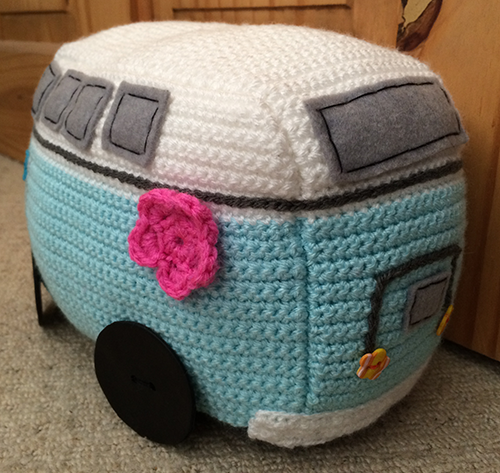 To finish off I added Fimo buttons for the lights and wheels, crocheted a couple of cute flowers and used felt for the windows. Just need to save up for the real thing now! I’ve seen quite a few examples of patchwork cushions and blankets on various blogs and websites. They’re a great way of using up your leftover stash, are quick and easy to make and are even a small enough project to take on the daily commute! 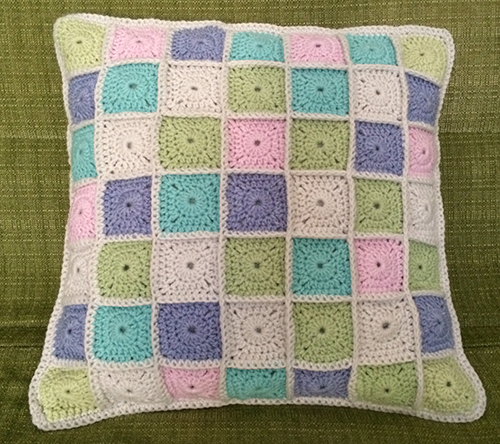 I wanted to make a cushion as a Christmas present, using a pattern of multiple squares in natural/period colours. I bought a selection of six Sirdar Snuggly DK yarns in blues, greens, pink and stone. 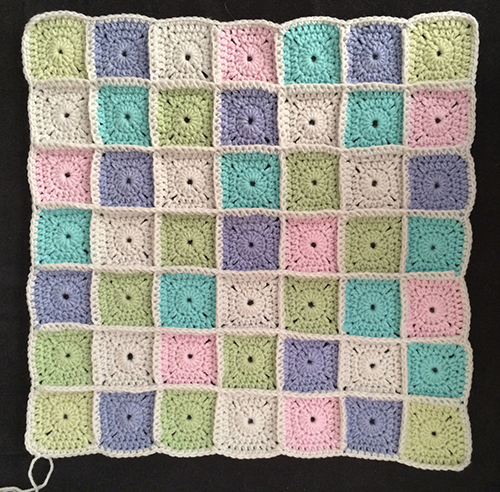 Having looked at a couple of projects for inspiration, I made up my own pattern and crocheted a total of 49 squares (7 x 7). 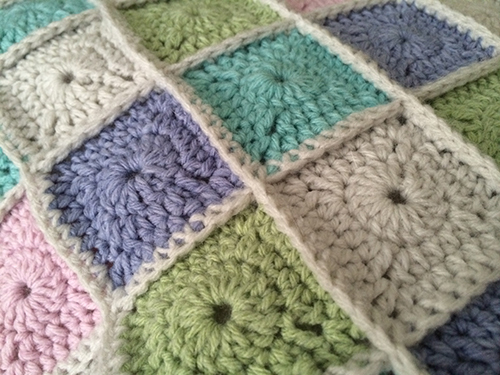 I used a simple DC stitch in the stone colour to join the squares together. The visible seam forms part of the overall aesthetic. 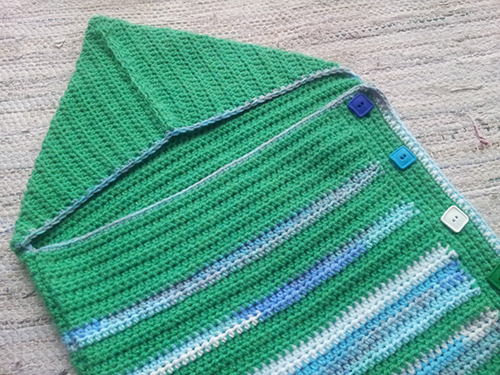 For the back of the cushion I used the stone colour and rows of treble stitch, which grew really quickly. I made two rectangle pieces that I overlapped and fixed with buttons. 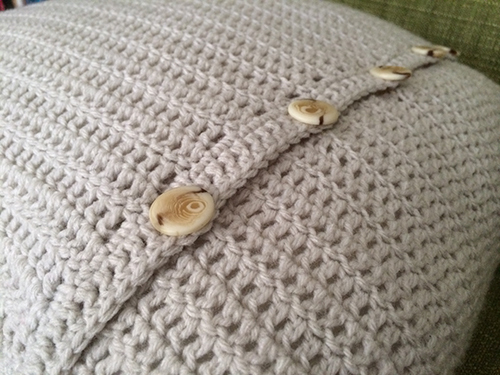 The finished cushion measures 18″. I recently bought a copy of the Natural Knits for babies and toddlers magazine. It was a real inspiration as not only were the patterns adorable and contemporary, but each item was finished off with handmade buttons – perfect combo! 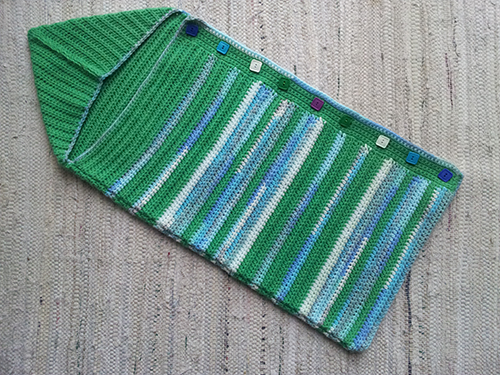 I’ve never been a big fan of ‘blue for a boy and pink for a girl’ and opted for Sirdar snuggly baby wools in a bright fresh green, multi blue stripes and a natural white. I made a simple pattern using alternate dc and treble stitches along each row. Making two rectangles, the front piece is about 2cm narrower than the back to allow for the button band. After stitching the pieces together and sewing up the hood I finished the piece off with nine polymer clay buttons in contrasting colours. This is the finished item!